Imagine being able to remove pages from your mixed media book, allowing them to dry, and then replacing or rearranging them in the book — in any order you choose! 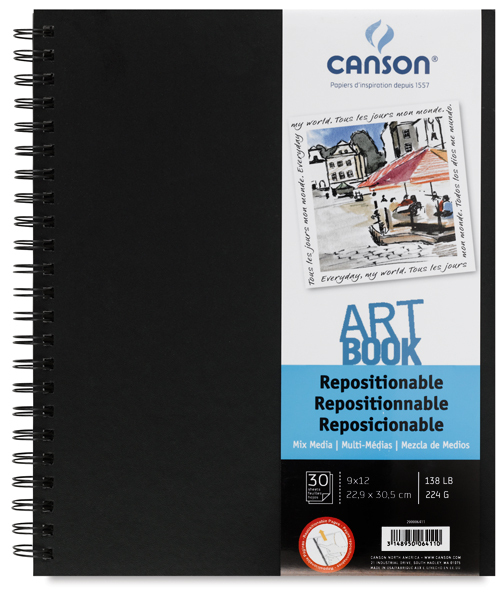 The revolutionary arrowhead wirebound system in Canson’s Repositionable ArtBooks lets you do just that. Excellent for a variety of mixed media applications, this book contains 30 sheets of heavyweight (138 lb, 224 gsm) paper. The double-sided paper features a fine tooth on one side and a medium tooth on the other side. Both have excellent erasability.